Savannah is home to not only the best ice cream on the planet but the biggest Girl Scout attraction on the planet too! Leopold’s is proud of our work with the Juliette Gordon Low Birthplace and proud to offer our Girl Scout Picnic Packages as well! Leopold’s welcomes visiting (and local!) troops and offers a delicious, nutritious, homemade meal complete with the sandwich of your choice, a side of chips, a piece of fruit, a drink and a single scoop of ice cream at a reasonable price. Each girl may choose the sandwich she wants (please see our FAQ’s for exceptions) and may have the ice cream flavors that she selects! We also offer special Leopold’s Ice Cream patches that would be the perfect addition to any scout’s vest. Full Sandwich Option – $14.84 – Full sandwiches do not include fruit but do include your choice of chips or homemade Pasta Salad. Each meal comes with a Party Pass which allows your troop to return to the shop and go through the line so that each scout may choose a single scoop of her favorite flavor from all that are available in the dip case at the time of your visit. We request that all Girl Scout Picnic Package orders be submitted at least seven (7) days prior to the date you wish to have your meals. We will do our best to accommodate any orders placed with less than seven (7) days’ notice but cannot guarantee that we will be able to do so. If this is the case, we will contact you immediately to try and reschedule your order. If we are unsuccessful, we will refund your money. As much as we would love to reserve seating for your troop, we have very limited space in the shop and therefore cannot offer reserved seating. Plan ahead to have your order delivered to your hotel, the Juliette Gordon Low Birthplace or one of our beautiful squares! Delivery in the downtown area is only $10. We are located between Reynolds and Oglethorpe Squares. 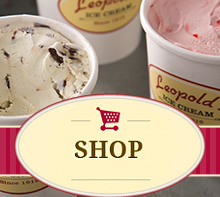 Both make beautiful spots for a picnic – before returning to Leopold’s for ice cream, of course! If your troop was planning to visit during one of the above dates, please let us know so that we can send a list of our friends in town who also offer a fabulous Girl Scout meal. If you have questions, please feel free to email our Girl Scout Coordinator at info@leopoldsicecream.com with Girl Scouts in the subject line. We look forward to seeing you and your girls soon! Are Girl Scout Picnic Packages available for lunch and dinner? Absolutely! Girl Scout Picnic Packages can be scheduled anytime between 11 am and 9 pm. We welcome both lunch and dinner orders. How many days in advance should the orders be submitted? We require at least a seven-day notice to ensure that we have enough delicious food and are able to schedule staff appropriately to accommodate your group. We will do our best to accommodate any orders placed with less than seven (7) days’ notice but cannot guarantee that we will be able to fill the order. Due to the extreme popularity of our Girl Scout Picnic Packages, at times, there are dates that will not be available for new orders. Please place orders early! All pre-orders are final. How much is your Girl Scout patch? How far are you from the Birthplace? We are just a short walk away – about five blocks. Click “VIEW LARGER MAP” below for easy walking directions! What are the choices for the ½ sandwich? All sandwiches on our menu are available except for the Shrimp Salad and Club. What are the choices for the full sandwich? All sandwiches on our menu are available in a full sandwich option. Can I get soup with/instead of a half sandwich, a milkshake instead of a single scoop, etc? No. There are no substitutions available in the Girl Scout Picnic Packages. Anything additional can be purchased at regular price. We serve the classic – Lay’s chips! What are our fruit options? What types of drinks do you offer? Coke, Diet Coke, Sprite, and bottled water. What options do we have for ice cream? Any of our ice creams on display will be available to you and your girl scouts as a single scoop in a cup, sugar cone, or cake cone. Do have any vegan ice cream options? Yes! We now offer a Vegan Vanilla ice cream made with coconut cream. Also, all of our sorbets are vegan-friendly. Do have a gluten-free ice cream option? Yes! All of our ice cream, with the exception of flavors that include cookies or cakes, is ingluten-free. If you cannot have gluten, ask for a manager when you come to visit and let them know that you cannot have gluten. They will steer you clear of any flavors with gluten and can also scoop with a freshly washed scoop from an unopened tub to avoid any cross contamination. We do need to inform you that we use the same equipment to make all our frozen products. Do have a gluten-free sandwich option? Yes! Any of our sandwiches can be served as a salad. Is your ice cream safe for people with nut allergies? We do use the same machinery to make all flavors of our ice creams and sorbets. Many of these flavors do have peanuts and tree nuts in them. We wash and sanitize the machines between each batch, but we could never guarantee that they are completely nut free. Are your sandwiches safe for people with nut allergies? We do serve several sandwiches that contain nuts. Because we use the same areas to prepare all of our sandwiches, we could never guarantee that any of our sandwiches is completely nut free.